Companion services are just one of the many ways that elder care providers can help your senior. But what does it mean for someone to serve as a companion for your aging adult? This type of assistance can look different in every situation, but these ideas can give you a basic definition. They Can Make Sure She’s Safe. Elder care providers offering companionship are right there with your aging adult. This gives them a chance to look at the situation and see what needs adjusting or changing in order to help keep her safe. They can let you know about any bigger issues so that you can take care of them yourself. They Can Help with Transportation. Often aging adults realize that driving isn’t a good idea and this can manifest in a few ways. Your elderly family member might opt to stay home and never go anywhere, which isn’t good, or she might try to drive anyway, which is unsafe. Having someone there who can drive for her removes both unpleasant options. They Can Help Make Sure She’s Eating. If making her own meals is feeling like too much effort for your aging adult, she might not be eating as well as she should be. Having someone there to make meals for her is incredibly helpful because you’ll know that your elderly family member is eating healthy foods. Your senior is simultaneously saving some of her own energy that she can use to do other necessary tasks. They Can Help with Errands. Errands can be much more difficult as your senior ages. She might not be as mobile as she once was or she might even be a little afraid to go out on her own. Having someone to go with her ensures that she’s able to do what she needs to do and she’s not alone. They Can Just Be There with Her. A big part of companionship services is simply being there with your senior. Elderly care providers can talk with your senior and simply spend time with her. This is beneficial for your aging adult, especially if she doesn’t have many friends or family members in the area any longer. Companions can do a lot for your aging adult in a non-threatening manner. 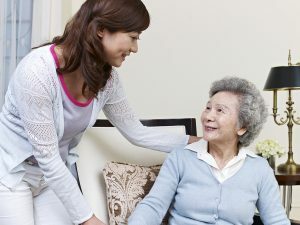 In fact, your senior might accept help more readily when it’s offered on the basis of companionship and someone doing something just because they’re there and it needs doing.